Of the writings of Peter Lombard (born in Lombardy c. 1100, died as archbishop of Paris in 1160) the most famous was his Sentences, a systematic compendium of theology in four books. 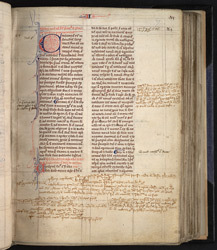 On a flyleaf of this manuscript is a 14th/15th-century inscription stating that this manuscript was given to the Gilbertine priory of St. Edmund, Cambridge, by Master John Hanworth, while another inscription records its presentation from Christopher Anstey to H. Yate, of St. John's College, Oxford, in 1775. This is the start of the second book (of four), as indicated by the running-number in red and blue roman numerals in the top margin.